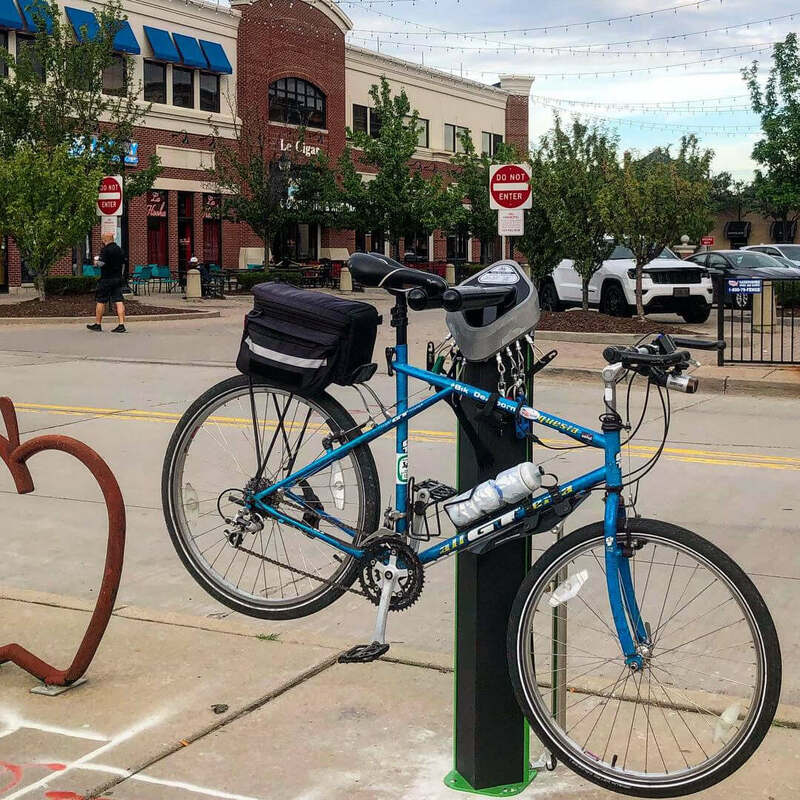 “The Better Bike Project is a first for the City of Dearborn. 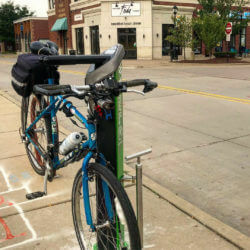 Through this project Bike Dearborn has been able to install the first two Public Use Bike Repair Stations in the City. These Bike Fixation brand Deluxe Public Work Stands include a bike pump and all the tools necessary to perform basic bike repairs and maintenance, from changing a flat to adjusting brakes and derailleurs. The stations have a high visibility powder coat and feature vinyl graphics with the LMB logo and the other funders of this project. The second repair station will be located along the extremely popular Rouge River Gateway Trail, just on the outskirts of West Downtown Dearborn. 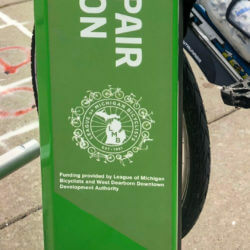 This repair station will be located on an existing concrete slab at the trailhead in close proximity of the trailhead parking lot, John D. Dingell Transit Center, Ford Field Regional Park, and the Dearborn Historical Museum. Funding for this station came from the LMB grant, Dearborn Mayor Jack O’Reilly’s One Dearborn Foundation, and Dearborn Brewing. The second station has been purchased but installation has been delayed due to construction by Wayne County. A “fishway” passage is being constructed by the century-old Jens Jensen dam at Henry Ford’s Fairlane Estate. This construction has caused a closure of the Rouge River Gateway Trail near the installation site. The repair station will be placed at the trailhead in the next few months once it is verified that it will not be damaged by construction traffic. The City of Dearborn has generously donated the time and labor of the DPW crew to install the stations. The City and related departments have been extremely supportive of this project.